LONDON, England (CNN) -- Controversial Dutch filmmaker Geert Wilders condemned as "crazy and cowardly" Britain's refusal to let him enter the country Thursday. 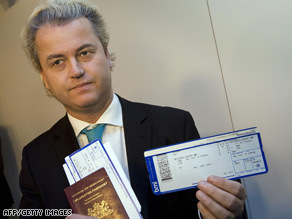 Geert Wilders shows his passport and boarding pass at Amsterdam's Schiphol airport before leaving for London. Wilders, a Dutch lawmaker who produced a much-criticized film about Islam last year, flew to London for a screening of the movie despite being told a day earlier he would not be admitted. "I still believed and hoped that they would change their tune," he told CNN by telephone, saying he was speaking from a detention room at London's Heathrow Airport. He said he was met by customs officers as soon as he left the plane. He called it a "very sad day" for "freedom of speech in the European Union." Wilders had been invited to screen his film, "Fitna," at the House of Lords on Thursday evening. The 15-minute film features disturbing images of terrorist acts superimposed over verses from Islam's holy book, the Quran, to paint Islam as a threat to Western society. Britain's Home Office said barring Wilders is allowed under European Union law, which permits states to refuse entry on the grounds of public policy, public security or public health.